Don't miss this opportunity to interact with more than 25 employers that are coming to Bishop's to recruit full-time and summer employees. 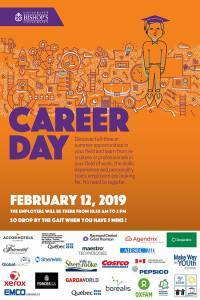 This is a great opportunity to discover opportunities in your field of studies and network with potential employers. No need to register.